I was very interested in your Sunday discussion of the new Buddleia which your team will offer for sale in 2007. I had first seen this evergreen Buddleia (Buddleia lindleyana) about 25 years ago in North Carolina, but had forgotten all about it and lost track of this shrub until recently. Several months ago, we began the re-landscaping of the old 41 acre property formerly owned by landscape architect Jim Keeter just south of Boerne, Texas on Scenic Loop Road. This Buddleia is growing (obviously planted by Jim) in areas around his home. The area is heavily wooded with mostly native species, quite shady, and home to herds of whitetail and Axis deer. The plantings seem to have been abandoned for many years (I'd say at least the last 10 years) and able to withstand acute drought and dense shade as well as full sun. Likewise, the deer seem to bypass this shrub, and it resists winter defoliation due to cold. One of the best descriptions of this plant is found in Volume 2, The Useful Wild Plants of Texas, the Southeastern and Southwestern United States, the Southern Plains, and Northern Mexico. Authors are Scooter Cheatham and Marshall C. Johnston with Lynn Marshall. From Volume 2, I quote: "Buddleia lindleyana Fort. (butterfly bush) is a native of China, but has been cultivated extensively in the southern United States, where it has escaped and naturalized in cultivated ground and along roadsides in the Coastal Plain from southeastern Texas east to Florida and Georgia. This is a diffusely branched shrub to 2 meters (6.6 feet) tall, with four-angled branches. The glabrous leaves, up to 1 dm (4 inches) long, are ovate to lanceolate, acuminate, and entire to remotely denticulate. The flowers are in upright and rather dense spikes up to 2 dm (8 inches) long. The corolla is purplish to violet or reddish and about 15 mm (0.6 inch) long, the tube being slightly curved. The seed capsules are 4-5 mm (0.16-0.2 inch) long. It flowers summer through fall. The species is presumably named after John Lindley (1799-1865), a professor of botany in London and editor of Edward's Botanical Register. Synonym: Adenoplea lindleyana (Fort.) Small." Volume 2 indicates that the shrub is also extensively found in both North and South Carolina as well as Florida and Louisiana. Due to the extreme drought resistance of this shrub, it's obvious deer resistance, evergreen nature, almost constant blooming period (it's blooming now in December), insect and disease resistance shown by the plants in Boerne, and ability to take care if itself, I believe that this will be an outstanding 'new' plant introduction in Central Texas. It might also be enjoyed by gardeners as far North as Dallas as shown by its cold tolerance in the inland, highland areas of North and South Carolina. In the rocky soils of Boerne, the tendency to sucker is not very obvious, but even so, I believe that the good points of this shrub far outweigh the negative aspect (suckering). It also seems to be extremely easy to transplant (even bare root in the midst of summer) and easy to root as cuttings. There has been controversy over the spelling of this genus for hundreds of years. Many horticulturists, including L. H. Bailey, spell the genus: Buddleia. The International Code of Botanical Nomenclature uses this spelling: Buddleja. The name has been the source of some confusion. By the usual practice of botanical Latin, the spelling of a genus name made from "Buddle" would be "Buddleia". However, Linnaeus wrote it down as "Buddleja", and never changed it, so by the rule of naming priority, "Buddleja" should be preferred, though the i/j interchange could be modernized as an orthographical variant. Even so, the usage is confused, and inconsistencies are common, even within single texts. Buddleja, also often spelled Buddleia, is a genus of flowering plants. 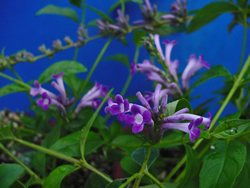 It is now included in the Scrophulariaceae, though in the past was previously classified in either the Loganiaceae or in a family of its own, the Buddlejaceae. The plant was named after the Reverend Adam Buddle who was a botanist and a rector in Essex, England. 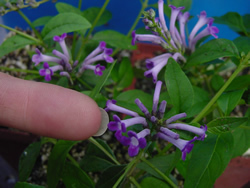 During a recent discussion of the B. lindleyana, you mentioned that the cuttings you are growing came from a specimen in Seguin which may have flower clusters longer than 5 inches. If that is the case, we may be in great luck! 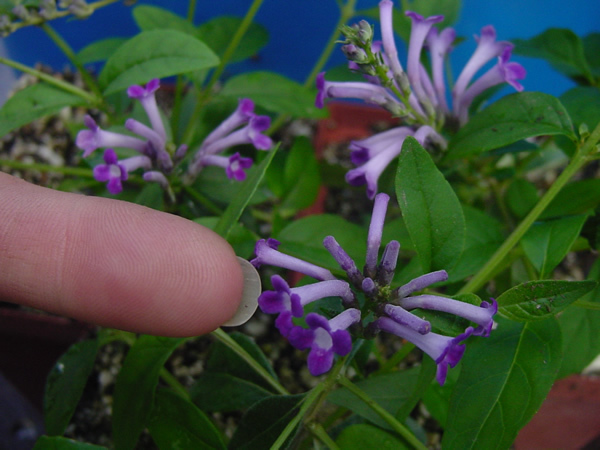 Today (23 January 2007), I measured flower clusters from the old specimen I know which is growing outside of Boerne. The flower clusters on that group of plants are 5" or less in length, and a beautiful shade of light, lavender purple. However, there is an 'improved' selection of B. lindleyana which has flower clusters which are longer than 5", and more impressive than the plant I know of in Boerne. 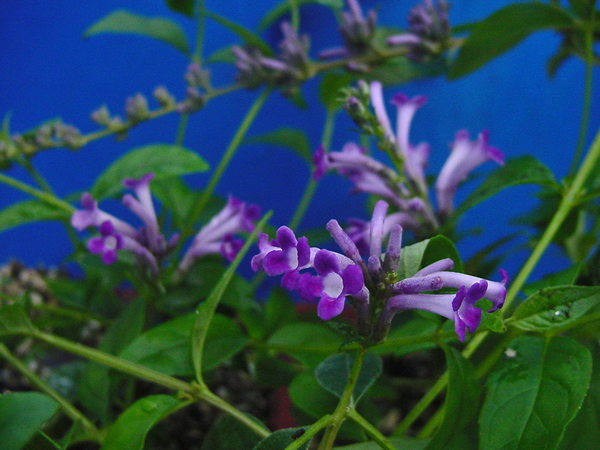 The improved form is known as B. lindleyana 'Gloster'. I have tried to buy that plant in Texas, but it seems to have essentially disappeared from the nursery trade, and is in extremely short supply nationwide. If the specimen in Seguin happens to be 'Gloster', that will be a stroke of luck. Let's watch your specimens and see how big the flower clusters will be when well grown. I am very excited about the prospects of your cutting grown plants. appearance. Propagate from cuttings in summer. weak-stemmed evergreen or semi-evergreen shrub grows to about 12 ft (3.5 m).